Who can resist a fresh peach, eaten out of hand with a stack of napkins? It’s a close-your-eyes-and-savor-this-moment experience. For me, the U-Pick peach event is still just a concept near the top of my to-do list. I do gather more than my share at farmers markets where crates of golden and white peaches arrive as the mercury starts to spike. I bring them home by the dozen, some for snacking and some for menu planning. This time I decided to add some sizzle to accent the sweet, making a quick and company-worthy lunch salad. I grilled quartered peaches and arranged them with creamy Burrata and silky prosciutto atop a bed of lightly dressed arugula. With a hunk of bread, you have dinner in a hurry. Peach chutney is a quick simmered delicacy that pairs well with grilled summer fare. I love it with pork tenderloin, chicken, or shrimp. Make a big batch to share, packing it in mason jars for a sweet summer gift. Another favorite peach dish is a sassy stone fruit salad, featuring sliced peaches and plums dressed in a spicy lime vinaigrette. Serve it on the side with grilled pork or fish or save it for dessert as a topping for peach or vanilla ice cream. 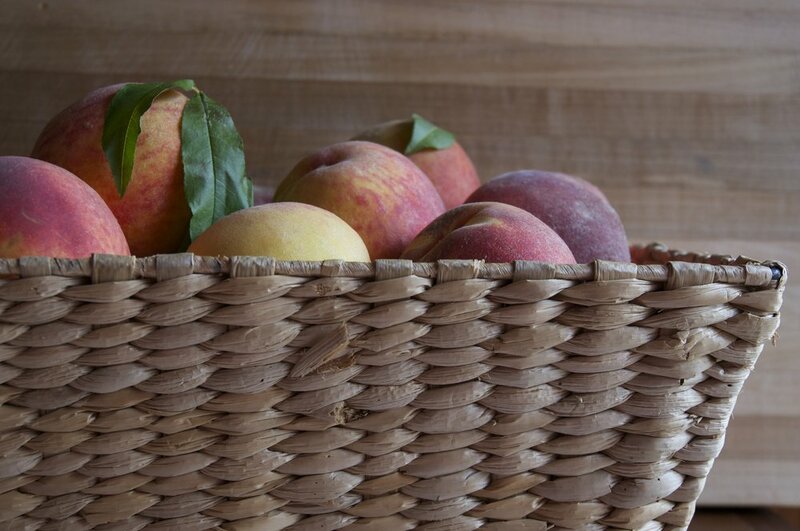 Though peach season will not last forever, there is no end to their delicious enjoyment. Be sure to pick a peck, whether straight from the tree or from your local market. The sweet perfume will remain. April Hamilton, the author of Counter Intelligence The Best of April’s Kitchen, is a happy transplant from West Virginia who now lives, cooks, and eats in Baton Rouge, Louisiana with her husband and youngest daughter. She blogs about her food experiences at aprilskitchencounter.com and is counting down the days until she can pick peaches at Plantation Pecan in Waterproof, LA. Brush the cut sides of the peaches with the vegetable oil. Toss the arugula with the olive oil in a medium bowl. Sprinkle with salt and pepper and toss again and transfer to a serving platter. Serve with grilled shrimp, chicken or pork. Makes about 2 cups. Add the onion and peppers and saute until tender, 5-7 minutes. Add the ginger, garlic, chile flakes and curry powder, and cook, stirring, for 1-2 minutes. Stir in the orange juice, honey, vinegar, and peaches. Bring the mixture to a simmer and cook for 10 minutes. Remove from the heat and let cool. Chill in an airtight container for up to 2 weeks. Whisk together the vinegar, honey cilantro, olive oil, lime zest and juice, jalapeno, and cinnamon. Add the fruit wedges and stir gently. Let stand 10 minutes. Season with a pinch of coarse salt and pepper.